Adapted from Andrew York's novel The Eliminator, this is a sloppily constructed spy thriller that aims for the gloss, levity and excitement of a Bond movie and misses by a mile. Always an inconsistent director, Seth Holt goes off on so many tangents that the central plot, about agent Richard Johnson's mission to kill a Soviet scientist before he can pass secrets to the Americans, is completely obscured. 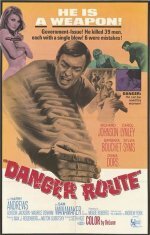 Johnson looks the part during the action sequences, but neither he nor a splendid but woefully wasted supporting cast can do much with Meade Roberts's dismal dialogue.